Get a trek quote to your inbox, today! Receive a price competitive quote from our trusted on-the-ground tour operator. 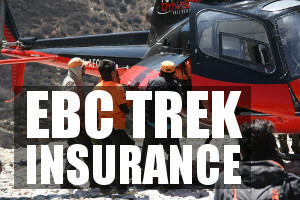 Get A Trekking Quote, Now! How Many People Die On The Everest Base Camp Trek Annually? As one of the most popular mountain treks in the world, the Everest Base Camp Trek is accessible to most people with a good fitness level and a decent drive to last two weeks hiking at altitude! As a non-technical trek that requires no mountaineering experience, the Everest Base Camp Trek is a great challenge for all people of all ages, shapes and sizes. Despite being a very achievable trek, there are still some challenges that come along with hiking 130km and climbing 3000m in altitude. Depending on your individual fitness level, a few weeks to a few months of prior training should be enough to get you into shape for the Everest Base Camp Trek. If you want to know more about the difficulty of the trek, check out our detailed article here. This article will give overview of the broad methods of training that you should implement in your own time before embarking on your trip to the Everest region. A key point to remember throughout the article is that all the training involves building up your level of fitness gradually, until you are comfortable with the lengths and distances you will be encountering daily on the Everest Base Camp Trek. Finding your own level of comfort when doing an exercise and then aiming to push that level further and further is the basic pillar of endurance training. As you will be hiking for 9 out of the 14 days on the hike, doing some practice hikes would make sense! A typical day will involve around 15km of hiking over the course of 6 hours – not a crazy amount considering it amounts to just under 3km per hour. The challenging part is that this will be mainly uphill and on rocky, unstable terrain. You also need to be able to hike comfortably on back-to-back days, which is why endurance is key. Practice hikes are important so that you can get used to the slow pace and rhythm that hiking uphill for long distances involves. You will get a feeling for which joints hurt and which muscles need strengthening. Starting as soon as possible, you should go on hikes starting at one or two hours, working your way up to 5/6 hour hikes. Ideally, these should be done in the hiking boots you will be using in Everest so that you can break them in, as there’s nothing worse than a big red blister after day 1 of 14! Aim to replicate the conditions you will be hiking in – uphill, 5/6 hours and with your boots and a backpack. If you do 3 of these long hikes before your trip and you feel comfortable then you should be fine for the actual trek. If you regularly go on hour long jogs and still feel good afterwards then your fitness level is already pretty good and you shouldn’t struggle at all. For most of us, however, some aerobic training is necessary so that we can cope with the high altitude/low oxygen conditions on the Everest Base Camp Trek. While the trek is done at an accommodating pace, the high altitude makes breathing slightly harder and will result in you tiring out much faster. Getting used to exercising under low oxygen conditions and training your body to optimise its oxygen intake per breath when exerting is a great way to make the trek more pleasant. While activities such as rowing, swimming and cycling will all build up your cardiovascular endurance, it is best to mimic the type of activity you will be doing on the trek. Start with 30-minute sessions of jogging up hill, or at an incline on the treadmill, and slowly work your way up to 60-minute sessions over a few weeks to months. This will increase your endurance while simultaneously working on the muscles that you will be using on the trek. While not as important as the abovementioned training, strength training on areas of your body that will be put under strain on the trek will help make the trek more enjoyable and will definitely result in less aches and pains. Aim to do 2 free weight, full-body strength training sessions per week. Using free weights will replicate the conditions of the trek and ensure your balancing muscles are put into use. Squats, lunges, step-ups and deadlifts are great for building lower body strength. Your legs will be worked extensively on the incline you will be facing on the Everest Base Camp Trek>, so these compound exercises are a great start. Bench press, pull ups and press-ups will help work out the upper body. While not used as much as the lower body, your upper body will still be tested as you carry backpacks for long distances. With all strength training, it is important to maintain proper form and to start at a comfortable level for 10-12 repetitions, then slowly work your way up in weight. While mental stamina is hard to actively train, it is still a very important part of any endurance trek. There will be days on the trek when it is cold and you are tired and sore from the previous day’s hiking, but you will have to push through and find the strength to hike even more! A lot of the mental strength will be built by training your strength and cardiovascular endurance as you will feel more comfortable on the mountain. You will not tire so easily and you will feel more ready to trek the next day as you will be less stiff. As you train, try and push yourself through the metaphorical ‘wall’ when you reach your limit. This is a great way to build mental stamina through showing yourself that you can achieve more. Luckily, you will be surrounded by a team of individuals on the trek who all have the same goal as you and who will encourage you to keep on pushing. Trekking in a group also provides a much more social and enjoyable atmosphere on the trek. You are sure to make some friends on a 14-day hike! With a little bit of preparation, the Everest Base Camp Trek is achievable for all. Follow the training plan listed above as soon as possible and you will definitely be in shape in time for the trek. Finally, keep a positive attitude – it goes a long way in making the trek an enjoyable experience! While it is hard to train for the high altitude of the region, you can read up on acclimatization and how it will affect the trek here. Very informative. Plan to do EBC trek next year either in May or October. Thanks Sethu! All the best for your EBC training! Thank you. I booked for september this year. Tommorow the sport gym will help me with a program to train. I will take this advise with me. And apply it to my training I also bought a training mask to get used to the altitude. Hi Kent, I would recommend the Annapurna Circuit: https://www.mountainiq.com/guides/trekking-in-nepal/routes/annapurna-circuit/. It doesn’t go above 20,000 feet, but is a wonderful wild trek with stunning scenery. Alternatively, the Manaslu Circuit is also a great option: https://www.mountainiq.com/guides/trekking-in-nepal/routes/manaslu-circuit-trek/. All the best! The information provided for EBC Treking is very useful and encouraging. Very useful, informative stuff. Wish I had read earlier as I am going there next week! Having done the Everest trek (from Jiri) many years ago, I can attest that the fitness regimen recommended is realistic, especially the attention to mental fitness. I would also emphasize the FACT that high altitude will bring challenges to both your mental and physical stamina, rarely encountered when backpacking at lower elevations. Good preparation will help ensure a memorable trip. Hi I know your blog is about base camp, we have no moutaineering experience and we’re thinking of adding on the labouche east summit, is this a realistic option without climbing experience? Hi Julia, I would not recommend doing Lobuche East if you have no mountaineering experience. Many inexperienced trekkers do attempt to climb Lobuche but I would say this is way too risky. The climb goes to very high altitude (well over 6,000m) and involves steep sections that require fixed rope jumar skills, the use of crampons and an ice axe. If you are looking for a high altitude trekking peak that is more accessible then Mera Peak may work, but again it is a big ask and a very high summit trek. If you do decide to climb any of the trekking peaks I would make sure you employ the services of a reputable company with qualified guides. Cheers! Hi Julia, I haven’t heard of Icicles Adventures so can’t comment, but in general for trekking peaks like Lobuche East, Island Peak and Mera Peak you want to find a company that employs qualified guides. You should look for IFGMA qualifications or equivalent. Does anyone know of a free download for an Everest Base camp trek plan? We’d like to begin our training ASAP and we know what to train just not sure how or for how long at a time. Hi Mark, I’m 59 but planning to do the trek in 2020. I’ll be 61 then. Have played soccer most of my life but that stopped about 10 years ago. Now, I’m mostly leading a sedentary life. Computer work. I do walk about 2 miles a day during my commute and avoid elevators as much as possible. But that’s it. Based on recommendations in this article, I should plan to hit the gym for a few months before the trip. Do you see any major impediments for me doing this successfully? Or is it perhaps out of my league? I did manage to climb Angel’s Landing last year (Zion National Park in Utah, do you know it? ), although I finished spent. About 5800 feet with over 100º weather. Not to be compared to the Himalayans, but a bit challenging all the same. Hey Ricardo, with a good exercise regime setup I’m sure you can trek to EBC. Last year I trekked with a few people, all of which were in their late fifties / early sixties, and all managed to make base camp without a problem. All the best! 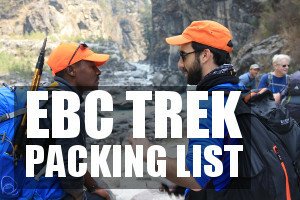 Do you have any recommendations for a trekking company for EBC? Tks so much, not only is your article very informative for a lay man, it’s also Plain Simple and Easy. I hope my trek goes the same way as you have explained. Thanks Mark. Very informative tips. I will try to implement the regime soonest for a March ‘19 trip. Thanks so much for that!! I am planning on doing the trek in a years time and I was starting to panic a bit that I would not have enough time to train. I am already doing a lot of the things recommended so I feel that if I keep going the way I am going the trip will be really enjoyable for me and I wont need to stress about my fitness. One thing I wanted to know about is the altitude fitness masks I have heard about, do you think these are a necessary training tool? Or should the above exercises/training be enough? I am coming over from NZ to trek hopefully starting Dec 15 from Lukla (if I can get a flight from KTM). I have queried a bus from KTM to Salleri then walking to Lukla. Can you tell me, is it approx 3 days from Salleri to Lukla. Also should I get a trekking permit in KTM before I leave or pick one up when I get into Lukla? What is easiest/cheapest? Also, is it necessary to book accommodation in Phakding in Decemeber or would I be ok? I was thinking of hiking Lukla to Phakding when I land. Also, considering trekking to Gokyo region first, then up to EBC area. I read somewhere I could get a guide from some parts of this region just to guide me over the Cho La (I understand that this pass may not be possible in December and certainly I would want an experienced guide for this). I have also heard its goregous along the other side of the valley down the middle from Gokyo (through Chhamtyang)? I had thought up to Gokyo down the other side of the valley (if Cho La impassable), then up to EBC through Periche. Is any accommodation necessary to book anywhere along this trail in Mid Dec-early Jan? We plan to do EBC April 2019. Would this be the right time? My husband is 59 and I am 55. We both are pretty active. Have done a couple of treks in India (uttrakhand) , US, Europe . Recently did Pun Hill in Nepal. I have a feeling that I do suffer from AMS as I had to cut short one of the treks last year. What would you recommend so that I do not suffer from AMS? We are planning to take longer time for the EBC trek. We do 6 km walk every day and one hour morning session of Yoga for 5 times a week. We will soon start training as per guidance given by you in the article. Any other recommendation? Hi Usha, Thanks for getting in touch. I recommend checking out our article on acclimatisation: https://ebctrekguide.com/altitude-sickness-everest-base-camp-trek. 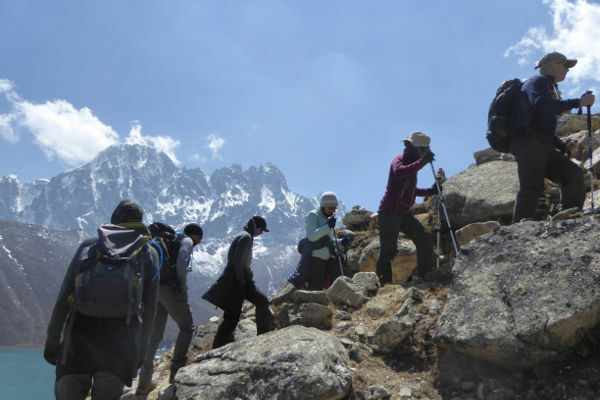 In general the EBC trek is well profiled for acclimatisation so as long as you don’t rush and build in some acclimatisation days on the way up, you should be just fine. It sounds like you are both in great health and are fit, so I’m sure you will have a great time! Thanks a ton for this guideline!! I am going to follow it up to the T.
If you are fit and healthy then I would say yes, but if in doubt about your weight then I would first check with a doctor.